BAE’s dodgy deals couldn’t have happened without the help provided over recent decades by both Conservative and Labour governments. The UK government provides astonishing levels of political and financial support to the arms industry in general, and BAE in particular. Perhaps most importantly, the company had a loyal servant in Tony Blair. In his autobiography, former Foreign Secretary Robin Cook observed “I never once knew number 10 come up with any decision that would be incommoding to British Aerospace”. Tony Blair went out of his way to promote arms deals for the company (in Saudi Arabia, South Africa, India) and overruled cabinet colleagues to approve controversial arms export licences (to Tanzania, Zimbabwe). In 2001 BAE sold a £28 million Watchman air traffic control system to Tanzania, one of the world’s poorest countries. The deal was pushed through by Prime Minister Tony Blair, despite opposition by his International Development Secretary Clare Short, who, said she did not think the contract “could have been made cleanly”. In 2002 the International Civil Aviation Organisation said the system used dated technology and was not adequate for civil aviation. Norman Lamb MP, who compiled a dossier on the deal, said a modern system could have been provided for 10% of the cost. The Serious Fraud Office’s investigations into BAE’s corrupt multi-billion pound deals with Saudi Arabia were stopped after personal intervention by Tony Blair. The support systems that promoted these sales remain in place today. 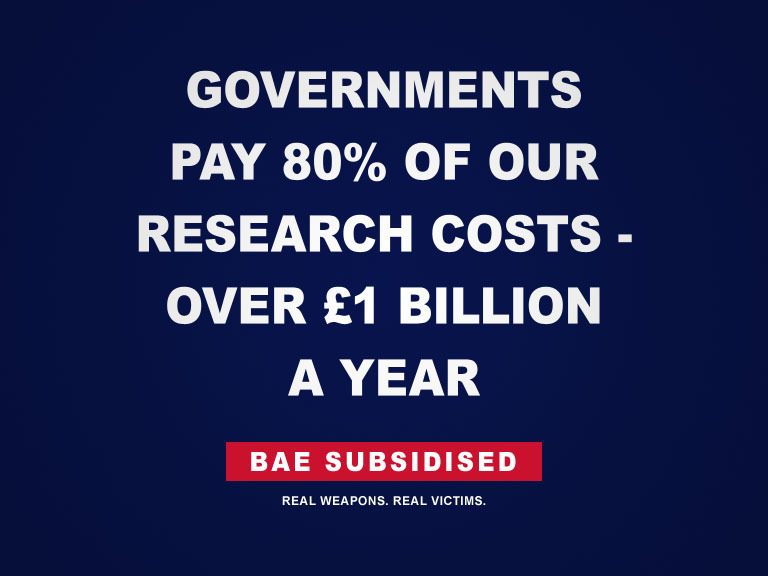 The Government is still working on behalf of BAE, and other arms companies, to promote weapons sales to unstable and repressive regimes and countries with urgent development needs. The government unit that supports these sales is UKTI DSO* which exists solely to help arms companies make deals. CAAT is campaigning to end the unquestioning and unjustifiable support the Government gives to arms companies today. Read more about UKTI DSO, and ask your parliamentary candidates to support our call for the closure of the government’s arms sales unit. BAE: committed to UK jobs?